There are more than a few hidden gems in Caldwell County, making this a perfect place in Texas to own a country dwellers’ dream or to invest in your commercial development interests. The rolling grasslands and spring fed rivers make a picturesque scene and the barbecue is unmatched throughout the state. It’s the charm and southern hospitality, however, that makes Caldwell County a great place to purchase property. In fact, that’s a large part of the reason that we at Graham Construction & Land Clearing call this area home. We have years of experience managing and handling projects for local property owners and land developers alike. Searching for excavating contractors or underground utility contractors in Caldwell County? How about someone to handle septic installation, land clearing or general site work? We have an intimate knowledge of the land and have been working in the area for years to improve and maintain local properties. Ranch Fencing is particularly important in Caldwell County as cattle are a primary commodity and they have a tendency to wander. Whether you want to keep your livestock on your property, keep other animals from getting in, or are more interested in making a statement with a beautiful fence line, we can do it all. We handle fencing, gates, and cattle guards among other things. Not only can we set you up with fencing to keep your property safe, we can also handle any aesthetic requirements you may have as well. There are many different types of soil and rock present in the Texas ground, and Caldwell County is no exception. This makes it difficult to do site work and develop land without expert advice. Fortunately, that’s what we offer. We have impressed our private property owners and commercial clients for years. If you’re looking to do a septic installation, or are in need of excavating contractors and underground utility contractors, we’ll help with that as well as any other projects you have in mind. 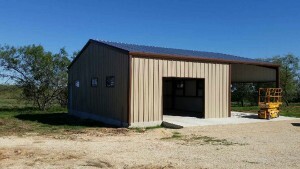 Metal buildings are custom designed by us for you. There are many reasons you may need a metal structure- you may want to add value to your commercial development by adding buildings to make the land more desirable, or, as a homeowner, it can be a place to house your belongings to protect against the harsh Texas weather. No matter what your needs are, we will be able to craft a reliable and strong structure that you can depend on. Caldwell County is notorious for its pecan and oak trees. Beautiful as they may be, sometimes they have to be cleared. We can help you with land clearing, as well as with removal of any other brush. We’ll also build you long lasting roads so you can easily access all your acreage. Land clearing is a great way to make your property more desirable if you are working on a development project. Not only do we at Graham Construction & Land Clearing know how to handle land clearing, metal buildings, ranch fencing, and site work, we also offer a host of other services. From wildlife management to septic installation to building ponds, we’ve been in the business so long that there isn’t anything we haven’t seen. Enjoy owning property in Caldwell County with your boots up and some Lockhart barbecue on your plate. We’ll take care of the land building and maintenance that has to get done.